The passage of the Affordable Care Act in 2010 has generated extensive activity to organize providers into clinically integrated organizations (CIO). Further, many government and commercial payers have introduced value-based reimbursements in recent years. Incentives such as the value-based purchasing program for hospitals have hastened the pace of organizational and structural changes around clinical integration. The approach outlined in this paper provides a unique set of services that focus on the clinical care process unit and recommends standardizing the approach to care delivery/process improvement. 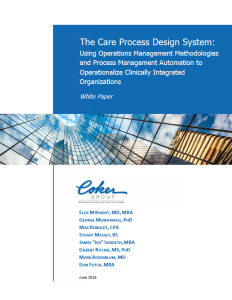 Readers will discover a comprehensive and systematic methodology for operationalizing CIOs, which, in turn, will allow these structures to attain the overarching goal of clinical integration.